If the system can not boot, bootable disc can be the best solution. 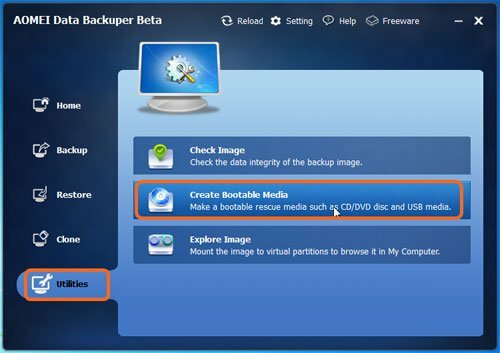 AOMEI Backupper can help to create bootable disc of Windows PE, Linux and make ISO bootable file easily and efficiently. Bootable CD is a kind of special disc, which contains a bootable operating system. This operation system generally is a compact version of Linux or Windows PE. A disc which has been installed a compact operating system is called Bootable CD. If the Windows operating system installed on hard disk, such as, XP, Windows 7, can not boot or suffers a system crash, we can restore the operating system through a bootable CD so as to make the operating system on the disc work normally again. It is always recommended to backup Windows drivers so as to restore them and insure a working computer after recovering system. Or you may download the magic tool Driver Talent for Network Card which is able to download and install network drivers without internet connection in case of no internet after system recovery. 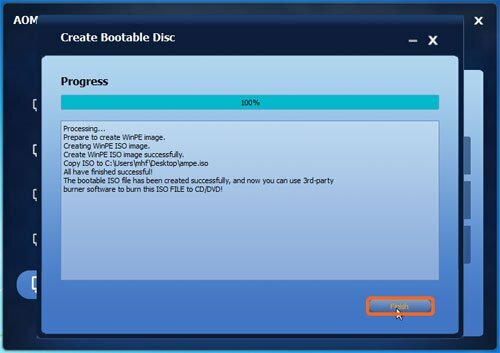 Create bootable disc will help you bott your computer successfully. The third party software AOMEI Backupper supports creating two kinds of bootable CD or USB Flash Drive. One is Linux boot disc, and another is Windows PE boot disc. The former one can be created straightway, while the latter one may require installing Windows AIK kit in your operating system in advance. Linux boot disc has several drawbacks. For example, some hardware does not support it, such as, hardware RAID; and some functions of the software can not be used. 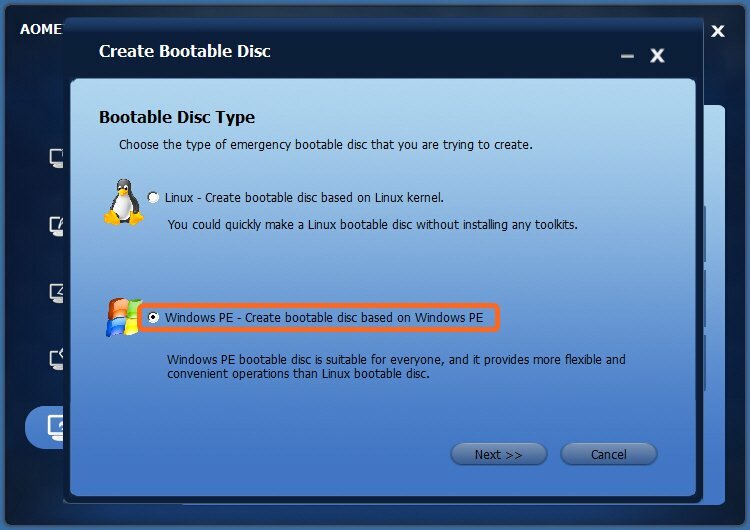 Therefore, we strongly recommend creating Windows PE bootable CD first. The comparison of the available functions between these two types of disc is as follows. When making a Windows PE bootable CD, AOMEI Backupper will check out whether your operating system meets the corresponding requirements. For instance, is it necessary to install Windows AIK? If it does, this software will provide corresponding notices. If your operating system is Vista or higher version of OS, such as, Windows 7/8/2008 R2/2011/2012, usually you can directly create a Windows PE bootable CD without installing Windows AIK. Here come the steps of creating bootable disc with AOMEI Backupper. Tip: Download this software, install and launch it. Step 1: Under the "Utilities" tab, select "Create Bootable Media" option. 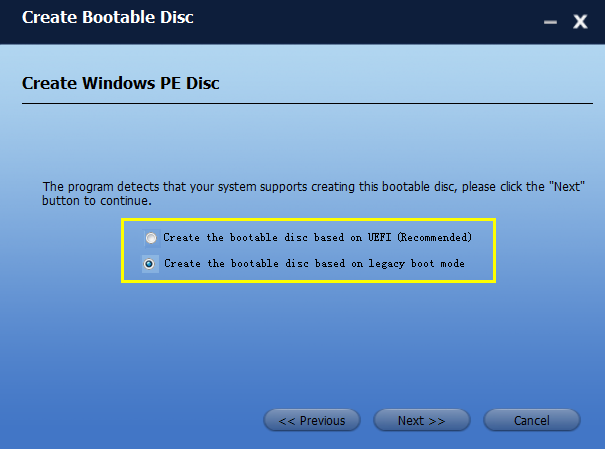 Step 2: In the pop-up window, choose "Windows PE-create bootable disc based on Windows PE" option, and then click "Next". Step 3: In Confirm the operations, and the click "Next" to continue. Usually, we suggest you to keep the first default option. 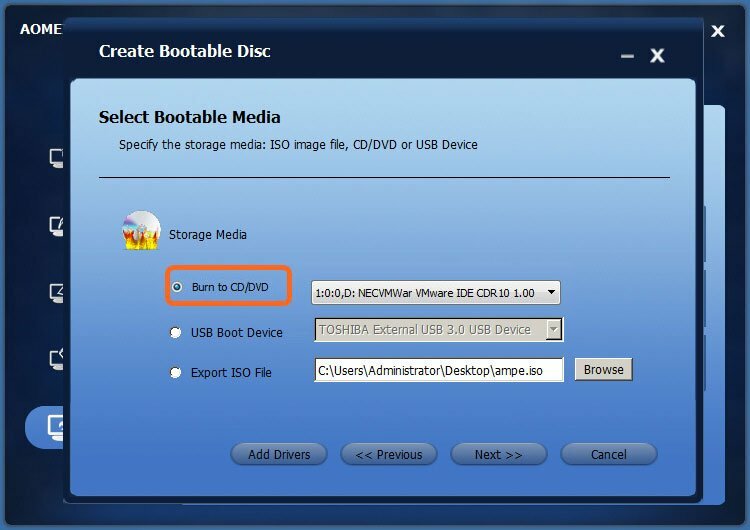 If you need to use the bootable media on multiple computers of different hardware configruations, (such as some computers do not support UEFI boot), you can select the second option for better compatibility. Step 5: When the operation is done, just click "Finish" to exit the interface. Then, you can reboot your computer, and set the CD-ROM as the first boot device in BIOS settings. 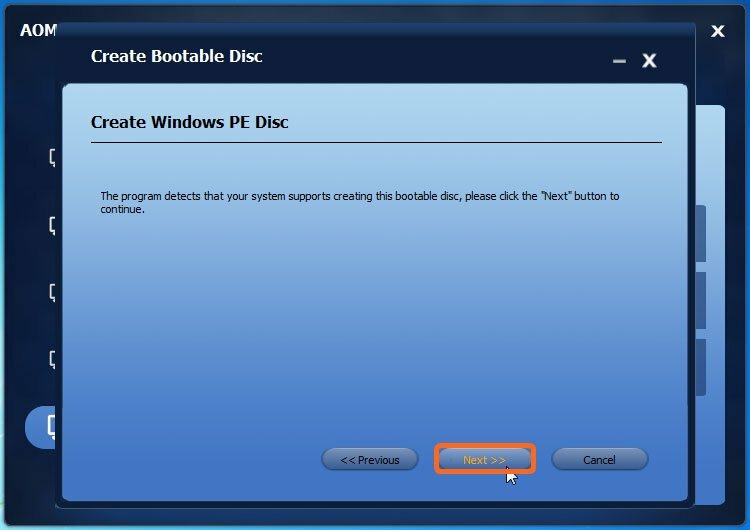 You can then access the operating system in the Windows PE disc, and realize backup and restore by AOMEI Backupper. If you do not have a CD/DVD, but a USB flash drive, you can use a USB drive to replace CD/DVD, to create a bootable USB drive. The making way is the same as creating a bootable CD. You just need to see the following screenshot, select "USB Boot Device" and click Next. 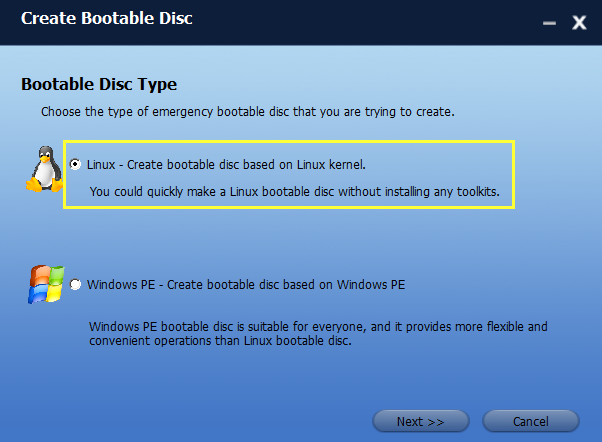 The way to make and use a Linux bootable CD is just the same as those of Windows PE bootable CD/USB Drive. The only difference is that you can create this kind of CD at any time without meeting any requirement, or need of Windows AIK installation. Just like what has been said before, the compatibility of Linux bootable CD might be a little bit poorer. 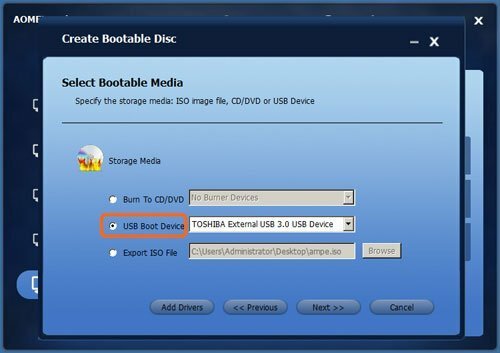 During the process of making Linux CD, if you do not possess a CD, AOMEI Backupper allows you create a bootable USB drive. The only requirement is that, when choosing the bootable media type, select the USB Boot Device. Then you can boot the operating system from the USB disk to do the recovery operations. Note: Linux bootable media does not support for EFI/UEFI boot, if your computer boot mode is UEFI mode, this need you to enter into BOIS to change the BOIS boot mode from UEFI to Legacy Boot Mode like the following snapshot (you may also learn how to change the setting by referring to the manual of your motherboard). 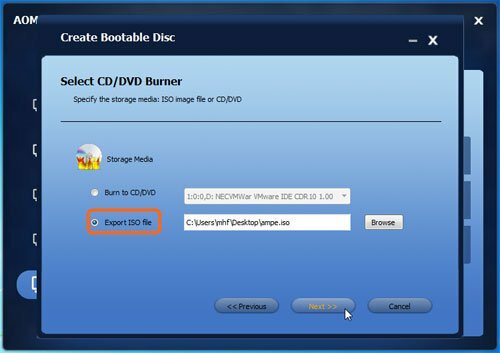 If you do not have CD or USB disk, or if there is a problem when making the bootable CD, you could create a bootable ISO file first, and then employ some burning software, like Nero to burn this ISO file to a CD or USB disk. Here come the operating steps of creating bootable ISO file. First, select "Create Bootable Media" option under the "Utilities" item. Then, in the next window, select "Windows PE" or "Linux" item, and click "Next" until you get to this interface. Then, select the "Export ISO file" option, and then click "Next". At last, click "Finish" when the operation has been done. Now, after creating the ISO file, you can easily burn it to CD or USB with burning tool and follow the tutorial how to burn ISO file to CD/USB to burn this ISO file. Also, you can complete this task with the Windows 7 integrates built-in burning utility by right clicking this ISO file > Open With > Windows Disc Image Burner.